Dogs and cats in the car can be a recipe for disaster, since dogs are driven by instinct to stick their heads out open windows and cats are hardwired to pee all over the leather seats as soon as car doors lock. So when you have a family of dogs, cats and humans, how do you safely get the furry members of your family to the vet or grandma’s house for a nice visit? And if you want to take a long car trip, what do you do with your pet? Here are seven things to remember when it comes to car safety for multi pet family. If your vehicle is too small to comfortably house you, your family, and your pets, don’t consider strapping your dog and or cat to the roof rack for the journey. If you drive a pick-up, don’t put your animals in the back where they can jump out into traffic or in a traffic accident. If your pets are coming along for the road trip and the only extra room available is the glove compartment, consider renting an SUV or minivan for the drive. Be aware that each state has a different set of entry requirements for dogs and cats; so for each state you plan to drive through, check with their department of health services for details. Before you hit the road, schedule a visit to your vet to be sure your pets are up to date with all necessary vaccinations, including rabies shots. Ask your vet for a health certificate to take on your trip that shows your pet is healthy and vaccinated. 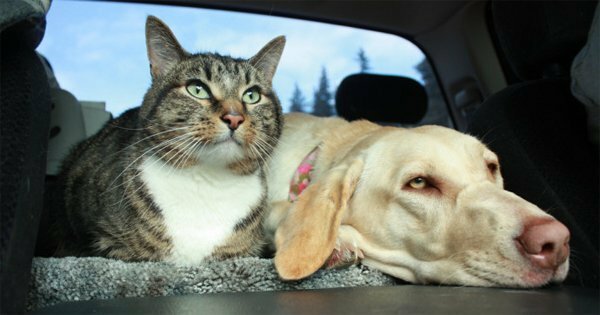 Both cats and dogs need to be restrained during a car trip (plus, in some states it’s the law). Just like any other loose object in a vehicle, a pet can become a dangerous projectile in the event of an accident — even at just 35 mph. 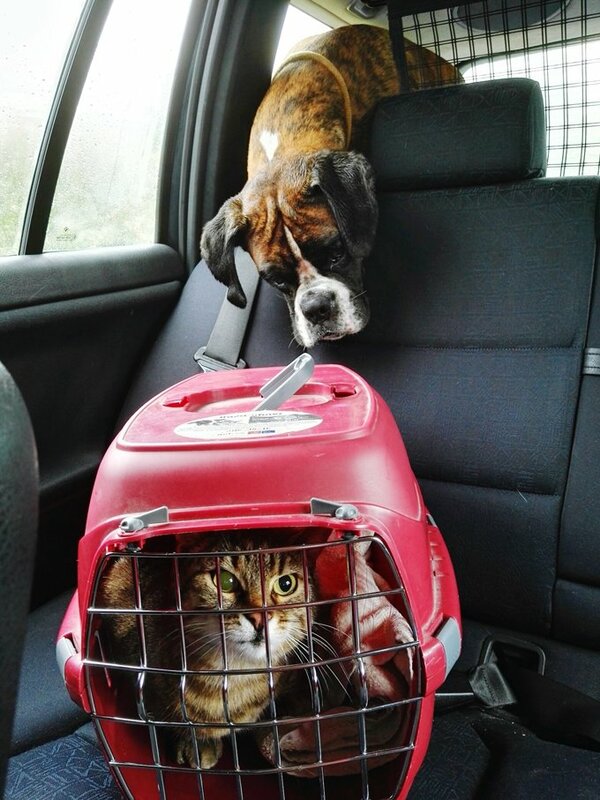 Cats can go in a cat carrier firmly strapped and secured inside the car. For dogs, there are several special dog harnesses on the market that work just like a seat belt. While the car is in motion, your cat is unlikely to want to use a litter box. So don’t worry about trying to fit one into a carrier since the end result will be a horrible mess as soon as you make a sudden stop. Instead, during lengthy trips, schedule times where you can stop and prepare and offer your cat use of a litter box. Along with eating and drinking water, it’s likely your cat will just wait it out until you reach a hotel room before doing their business. During your road trip, schedule stops along the way to walk and exercise your dog as well as your cat. Make sure your dog is leashed, as he or she may go after strangers or worse, run away from you. Your dog may seem a little nervous, and even aggressive as you walk them in an unfamiliar environment. Simply stay calm and in command of your dog so he or she understands everything is okay. The best place for your cat to stretch his/her legs is going to be in a hotel room so be sure to find pet friendly lodging along the way. You can also look into a cat harness that you should practice with to be sure your cat can’t escape and is comfortable walking with. The last thing you need is to find out the harness you selected isn’t right for your cat when you’re out at a park in a town you’re not familiar with. With cats, be sure there are no other animals around when you let them stretch their legs on leash in public. Anything could spook a cat. The world is a dangerous place for our little kitties. Both dogs and cats have ways of dealing with stress that don’t necessarily involve chewing the floor or barfing. In fact, you might be surprised at how calm your pets are during an extended trip in a car or on a plane. But if your dog or cat is particularly anxious during a trip, instead of medication, consider any number of natural, drug-free aids that help to calm animals when they’re experiencing low levels of stress. You should not leave your pet inside a car alone. No, not even for a few minutes. Nor should you let them out of their carrier with your car windows down or door open. As soon as a dog or cat sees an unfamiliar terrain, their first instinct will be to bolt and run away from you, your family, and your vehicle. This is why attaching some kind of ID to your animal is so important. At the very least, make sure your pet has a microchip ID so that they have the chance of being reunited with you if you do lose them.